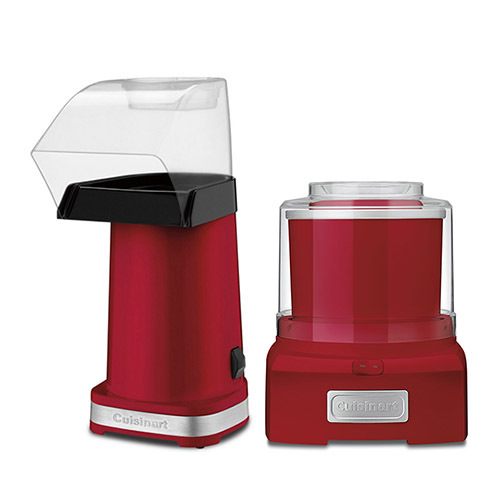 The Cuisinart CPM-100/ICE-21R is a combination of Popcorn Maker with Ice Cream Maker. The Cuisinart CPM-100 is a 1500 watts popcorn maker which makes plenty of popcorn in less than 3 minutes to share with family and friends. The kernels go into a popping chamber and hot air sends up to 10 cups of popcorn up and out the chute right into a waiting bowl. 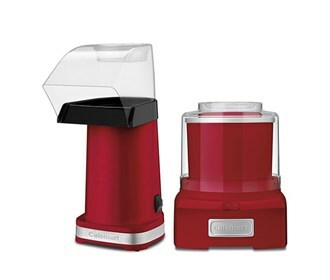 The Cuisinart ICE-21R is ice cream and sorbet maker which features double insulated freezer bowl and patent pending mixing paddle that makes frozen treats in maximum 20 minutes. It has large capacity and easy lock lid with large spout that makes adding ingredients simple and mess free. The Cuisinart Popcorn Maker and Yogurt-Ice Cream Maker has many exciting features for users of all types. See the Cuisinart Popcorn Maker and Yogurt-Ice Cream Maker gallery images above for more product views. The Cuisinart Popcorn Maker and Yogurt-Ice Cream Maker is sold as a Brand New Unopened Item.